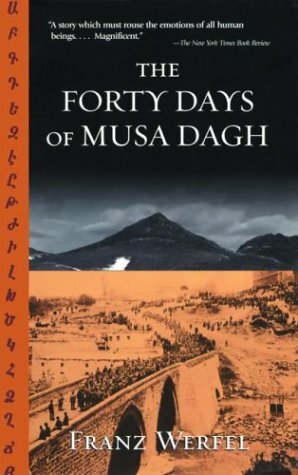 The Forty Days of Musa Dagh has been sitting on my bookshelves for six years. I finally started reading it last week. Now, after devouring the first of three sections (er... books), I'm going to set the book aside for a short time. It should be noted that this book is brilliant so far. The Forty Days of Musa Dagh is one of those rare books that makes me want to highlight passages, quote them, analyze them and dissect them to their tiniest commas and dashes. It's a dense book, no doubt, heavy with expectation and meaning. It's also only the second book I've ever read (or encountered) about the Armenian genocide, the first having been a kids book from seven years ago (an Amazon recommendation thus brought The Forty Days of Musa Dagh to my attention). Reading about the Armenian genocide in today's world is a fairly difficult task. Like Peter Sourian, writer of the introduction in my edition of the book, I repeatedly find myself making connections to the Holocaust. The more famous one, that is. The one that is heavily represented in literature. It's actually rather hard not to make such connections. Allow me the indulgence of quoting some lengthy passages. According to Wikipedia, Franz Werfel's novel has always been interpreted as referencing Jews and anti-Semitism. Werfel himself faced much anti-Semitic behavior in his life and twice had to flee the Nazis - the first time from Austria and later from France. The Forty Days of Musa Dagh was written in 1933, "prefiguring the atrocities of World War II" (as the back of the book refers to it). It's an eerily accurate and apt description. This second quote is taken from a conversation between the German priest Dr. Lepsius and the Turkish leader Enver Pasha. The conversation is full of comments that make the noble Lepsius (as well as the reader) want to rip his hair out. But what's remarkable is the way the similarities are drawn by the reader, not by Werfel himself. Werfel, at the time of writing The Forty Days of Musa Dagh could not have imagined what horrors Jews would face in Europe only a few years later. Some parallels are apparent - the fact is that by the 1930s, anti-Semitism was rampant in Austria. Werfel inserts the same fears, paranoias, stereotypes and false beliefs in as the views of the Turks against Armenians. The Turks are seen as jealous of the wealth and power of some Armenians. Of their positions in fields like medicine and accounting. Then the connections that I draw: the same absolute fear of a people deemed to be outsiders. The same desire to entirely destroy a race that is viewed as a "traitor", working from within to bring down an empire (and even more specifically, the new regime that represents a far more ancient empire). The methodological manner of completely destroying a group of people. True annihilation. Genocide. I'm certain I will have more to say after I read the second two "books" that comprise of The Forty Days of Musa Dagh. So far, it's been fascinating. Not only does it tell of a wonderful (also difficult) story (resistance is always interesting), it has taught me a lot and given me much to think about. I'll take some time to mull it over before diving back in, but I'm certainly looking forward to completing this book. I'm glad I'm finally giving it a chance. Thanks for the recommendation this looks like a good book. I heard about the Armenian Genocide and this book looks like a good way to learn more about it.